Darth Vader Jacket From Star Wars. FREE WORLDWIDE SHIPPING! Inside stitched viscose lining makes you feel soft and warm next to your skin. High neck collar and front zip closure elevate the jacket’s style. Not sure how will I do it but this is going to be saved for the snow. I just wore it in the spring, and I started sweating a lot in 12 minutes even with the jacket opened. Guess I need to save it for a better time and that is winter. It’s a so soft, durable and comfy. I let go of cardigans and sweaters to go with leather jackets. I’m glad I did that because this has got me into this type of outfit. Apparently, they look good on me. After ordering this, I went ahead and got three more but in PU this time. After wearing them for the first six months, I will find out which type of leather suits me more. For now, I’m going to enjoy this. Presenting you the Darth Vader Jacket, made from PU leather. This is something a true fan of Star Wars can’t ignore, especially from those who are in favor for the famous villain of Star Wars series, Darth Vader. Also in this Darth Vader Star Wars Leather Jacket is stitched with viscose lining along with two pockets, which you can easily store your valuables such as your Smartphone and wallet safely. The space is wide enough, as you will also find the same for the outside waist pockets as well. 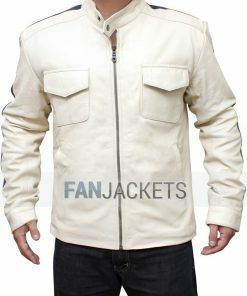 If this apparel is good enough for you, then you must wait no further and avail this immediately.